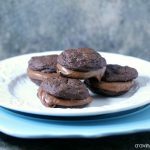 Seriously scrumptious Chocolate Fudge Brownie Sandwich Cookies that will impress your friends and put a huge smile on your face! Welcome to #cookieweek my little cookie monsters! 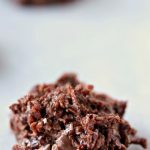 Susan of The Girl In The Little Red Kitchen and Kim of Cravings of a Lunatic have joined together this week with 23 of their blog friends to present to you a week of cookie treats! 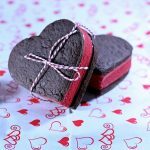 We have every type of cookie you can think of listed this week, including something for our furry friends! Now is the time to bookmark these recipes for the upcoming holidays and cookie swaps or simply visit our Pinterest board! Make sure you enter the giveaway with some fabulous prizes from KitchenAid, King Arthur Flour, OXO,Silpat and Zulka Pure Cane Sugar to help with your cookie making needs! You can buzz on over to my giveaway post to enter to win HUGE PRIZES for Cookie Week! We’ve got tons of amazing prizes up for grabs so hurry over there for your shot at them. 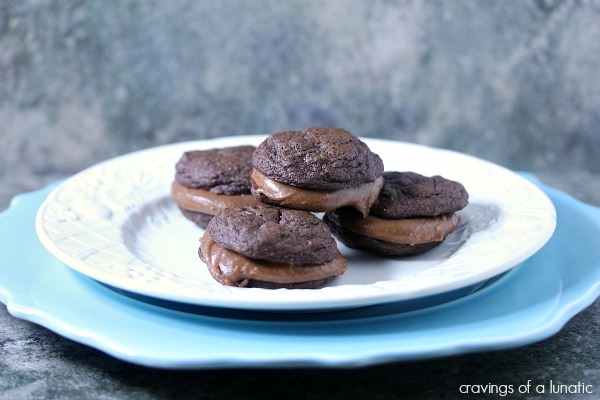 But before you go you might want to grab the recipe for these Chocolate Fudge Brownie Sandwich Cookies. They are amazing. I had some while they were still warm, some at room temperature and some cold. Let’s just say they are good at any temperature and I now need to let out the waistline on all my pants. In a large bowl sift together the flour, baking soda, unsweetened cocoa, and salt. Set aside. In your stand mixer combine the butter and sugar, whisk until fluffy and pale. Beat in the egg and vanilla extract. Beat in half the flour mixture. Add the buttermilk and beat again. Beat in the rest of the flour mixture until everything is well combined. Stir in the chocolate. Use a teaspoon and scoop small balls of batter on the cookie sheets, leaving a gap for a bit of spread. You should be able to get about 36 bits. At this point I highly recommend popping the dough in the freezer for at least 30 minutes, but preferably 60 minutes. If you don't do this the cookies will spread too much and be too flat. You're call though. If you like flat sandwich cookies knock yourself out. Remove the cookie sheets from the freezer and pop them in the oven. Bake for about 8 to 10 minutes. Remove and allow to cool for about 5 minutes. Then remove them from the cookie sheet and let them cool on wire racks. In a medium sized saucepan combine the chocolate, butter, brown sugar, and milk. Cook over medium-low heat to let the sugar dissolve. Then allow it to bubble for about 2 to 3 minutes. Remove from heat and then add the confectioners' sugar a little at a time. I just whisked mine in. Worked perfectly but you could do it with a stand mixer if you like. Spread a big dollop of the frosting on the inside of one cookie, take another cookie and place the inside down on the frosting. Give a little press. Shove in your piehole. 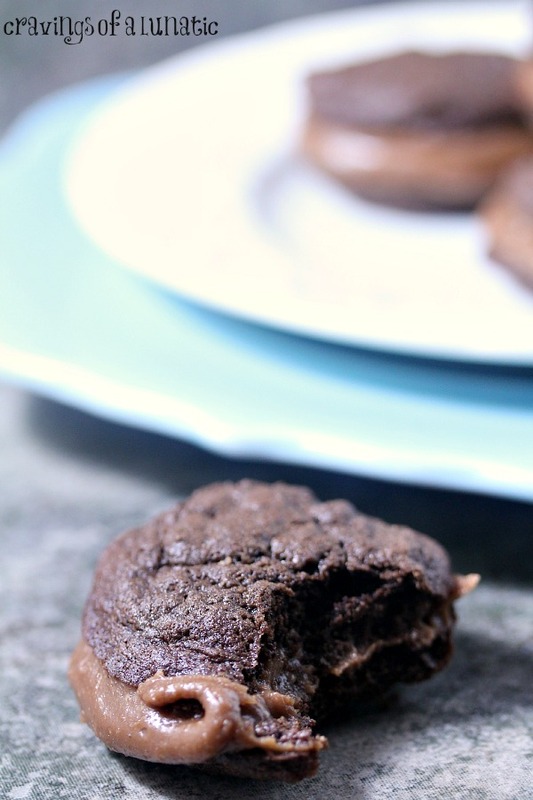 Serve with a big old I love Chocolate Fudge Brownie Sandwich Cookie Smile! Recipe slightly adapted from the cookbook Whoopie Pies recipe for Chocolate Fudge Brownie Whoopie Pies! 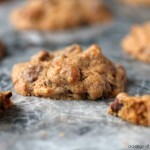 Make sure you stop by all the other Cookie Week participants posts to peruse their amazing recipes! You can stalk them all to make sure you get the full cookie experience! Remember to stop by my giveaway post for your chance to win amazing prizes! Disclaimer: The link to the cookbook inside the recipe goes to my Amazon Affiliate link. If you’d like to purchase the book I get a few pennies as a commission. I plan to use those pennies for more cookie supplies. Just keeping it real! Oh my gahhh….where’s my milk?! These look awesome, Kim! Now this is a chocolate cookie! I think that’ll satisfy one days craving! Thank you Kim for being a part of this! Kim, these sandwich cookies look amazing. I’m drooling all over my keyboard over here. OMG Kim!!!! These cookies look so chocolatey and peerrrrfect! YUMMMERS! The best reward for a cookie baker is a chocolate covered smile! You can NEVER go wrong when this much chocolate is involved! These look fantastic! I love cookies. And I love chocolate. And I love cookie season! Oh, yeah. These would disappear in a flash at the Berg household! Chocolate Nirvana!!! I am thinking that looking at these while I am at my desk and haven’t had lunch yet is a really bad idea….Now I’m starving. Oh myyyy gosh. I love the fudge oozing out of these! 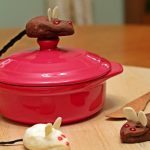 Thanks for hosting cookie week! Oh my goodness, Kim. Seriously, delicious looking…Lady like manners might fly out the window once I sink my teeth into these delectables! These look so decadent! 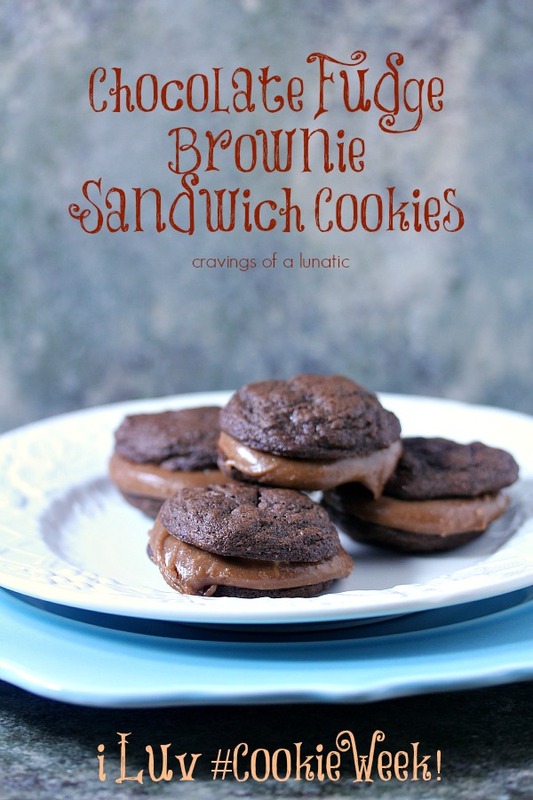 I’ll trade ya one peanut butter cup sandwich cookie for your brownie cookies. 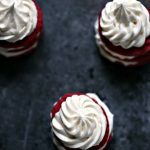 These look decadently delicious, Kim! Love that oozy frosting! I’ll have a plateful, please. 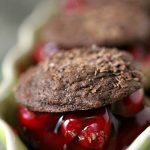 😉 These look terrific – all my favorite things rolled up into one cookie! Good stuff – thanks. Now that is the perfect way to have chocolate! Chocolate….not my thing but Dudette would be ALL over these! Double chocolate? How can you resist that? The frosting sounds so good. The picture with the bite out of it makes me want to just lick that frosting. Drool!